IT’S difficult to know who exactly was more relieved by Scotland’s first win in ten outings in the Six Nations Championship. If the players and coaches got fed up digging up new excuses every week there are only so many “Plucky Scots Robbed” stories that the press can regurgitate before the readers demand their money back. 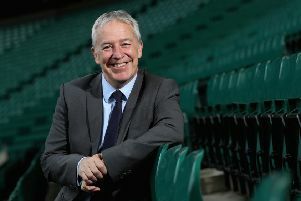 The Scotland coach allowed the flicker of a smile on his face. “Stern Vern” may have a public persona that is cartoon curmudgeon but at least he is savvy enough to make a sly dig at his own creation when the occasion demands. “It was a good start,” Cotter continued, “scoring two tries and I thought we kept the ball and put speed and tempo on to the game. We knew they would come back and they did and I thought they probably had the better part of the last ten, 15 minutes of the first half. “Credit to these boys because they stepped up and got themselves through what was a challenging second half and finished with a try. Rather than being worried about losing they strived for the win right till the end and scored that try. Laidlaw did look happy, as well he might. The little scrum-half had seen his team score three tries, gather the highest number of points by a Scotland side in the Six Nations and end that long losing streak. Moreover he had personally added a total of 21 points with seven kicks in all; a decent day at the office for the man who has struggled to stay positive in recent weeks. Scotland threatened to run away with a big win in the first 30 minutes, but yesterday’s tough encounter would have done them infinitely more good than a walk over. Moreover there was a feeling that, while Laidlaw went out of his way to praise referee Jaco Peyper, the Scots were on the wrong side of another refereeing error when Finn Russell was shown a yellow in the second half. The Scottish stand-off was on his feet at the time, he came from behind the back foot of the breakdown and the ball was not on the floor so it was a maul, which he is allowed to contest, rather than a ruck. Laidlaw was actually claiming the card should have gone the other way after being dumped on his noggin. “I am not the heaviest customer in the world but I was unduly dumped straight on top of my head,” he claimed. “I was trying to get him [Peyper] to at least have a look at it. “He just said we had slowed the ball down on a few occasions and Finn had done it this time. It’s tough to referee and we were happy with how Jaco had referred, he’s a good referee. Scotland’s defence was improved but it still lacks the bloody-minded defiance that Wales displayed on Friday night. Instead Scotland’s victory owed more to the set scrum which bossed the opposition all afternoon and will cause serious disquiet in a nation that has replaced “taxes” with “set scrum” in their list of life’s certainties. So they do, but you doubt that France’s scrum will cave quite so quickly.